In many areas of life, intense activity and constant monitoring can be a path to success. We don’t believe; however; it’s a fruitful (or enjoyable) path to follow when investing. That doesn’t mean we should do nothing, but it does mean the culture of “busyness” and chasing returns promoted by much of the financial services industry and media can work against our interests. Financial science and experience show that our investment efforts are best directed toward areas where we can make a difference and away from things we can’t control. We can’t control what the market does on any given day. We can’t control the news or the headlines that threaten to distract us. But we can control how much risk we take when we invest. 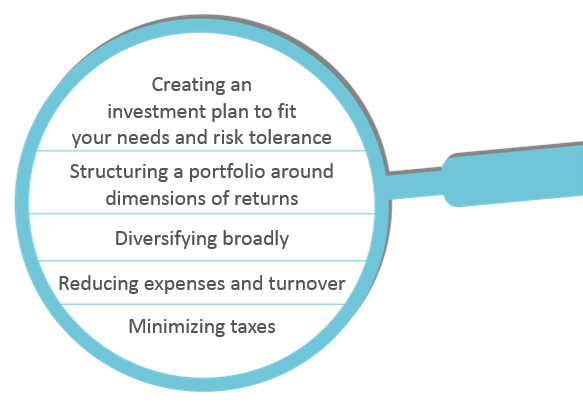 We can control the diversification of those risks by creating an investment plan that strategically spans across different asset classes, industries, companies, and countries. We can control transaction costs. And we can exercise discipline when our emotional impulses threaten to blow us off-course. These principles can be very challenging for some, because the perception of investing via financial media is geared around the short-term, the recent past, the narrowly focused and the quick fix. Why? Because no one would read a newspaper or magazine that always had the headline“Buy and Hold; Still a Viable Investment Strategy!”. No one can reliably forecast the market’s direction or predict which stock or investment manager will outperform. To have a better investment experience, people should focus on the things they can control. It starts with an advisor creating an investment plan based on market principles, informed by financial science, and tailored to a client’s specific needs and goals. Along the way, an advisor can help clients focus on actions that add investment value, such as managing expenses and portfolio turnover while maintaining broad diversification. Equally important, an advisor can provide knowledge and encouragement to help investors stay disciplined through various market conditions. This can lead to a better investment experience.